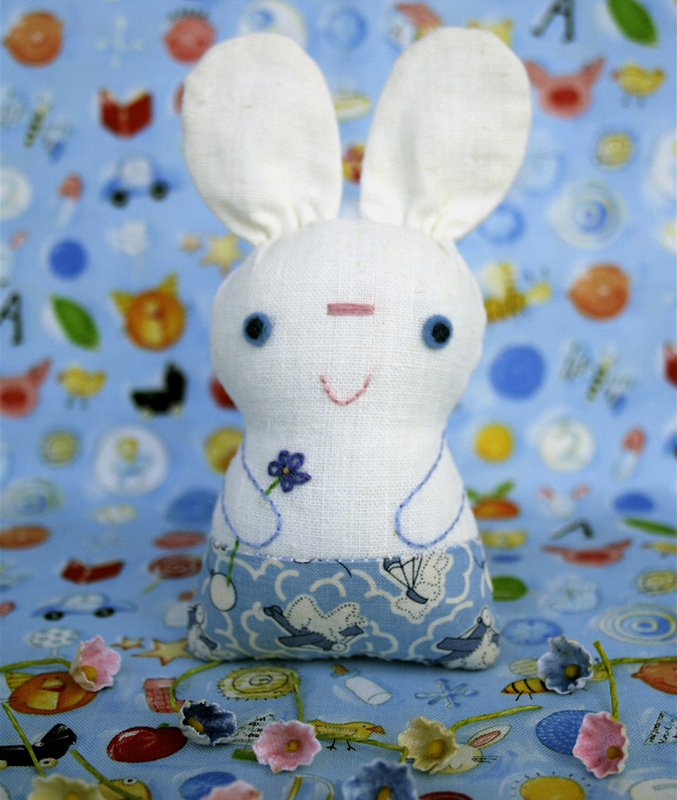 This week I've been playing around with a little rabbit I used to make years ago during my country craft phase. He's five inches tall and quick and easy to make from fabric scraps in your stash. I updated it a bit and added some pants for him this time and I also did up a pattern and tutorial for downloading (in PDF format) below. The way I made him may be a bit unconventional as I prefer to do the face before stuffing and I don't like dealing with cutting out and joining little fabric pieces. I also added the option of felt arms instead of embroidered ones and a pattern for a kitty as well. If you prefer your critters au naturale and in their birthday suits, then just trace the pattern onto one piece of fabric, sew, stuff and you're done. Let me know if you make one, I'd love to see it. 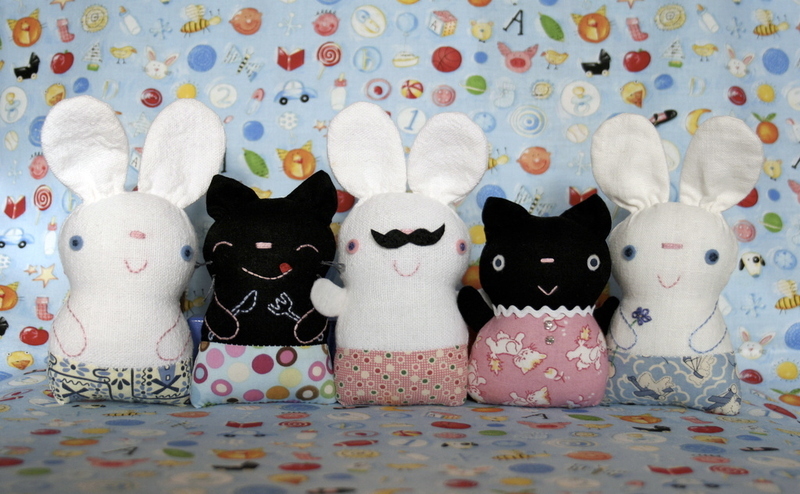 And since it is WIP Friday, here's a group shot of all the rabbits and kitties I made until I got the pattern to how I like it. Download free at Craftsy here. oh, so cute! country craft was my first crafty phase! thanks for the pattern, i have some fabric that needs to be put to use. Your bunny is toooo cute, and I love the one with the moustache. What fun ! thank you for the pattern, i love the one with the fork and knife...very charming. those are soooo cute! - very nice of you to share the pattern! Oooo... free pattern of something adorable? So generous! How could these guys be rejected? They are all so wonderful--love love kitty with fork and knife--but I have black kitties on the brain so I am most certainly biased. These are so adorable. Perfect for little gifts and such. Thank you for sharing the pattern. I'm a sucker for bunny ears so I can't wait to make one. Thanks, Myra. The cuteness is almost unbearable. Get ready to set up a Flickr group...! You have such a definite style, and I'm so excited to be able to create a mochi-esque softie for my girls. Thanks again! That is some super cute background fabric, too, by the way. That piggy face...! Love it. Thank you so much! They're adorable! so sweet Myra! and i love seeing them all in a row... thanks so much for sharing! aren't you the sweetest! I can't wait to make some of these. I love your blue bunny fabric in the first photo. So very cute. Thank you so much for sharing your pattern! Myra - these are fantastic :) Thanks for sharing the pattern and photos :D Will have to bookmark for printing! That kitty with the fork and knife and little tongue is so wonderful! What great work! And you put together the pattern, too. That's awesome. Yeah, you should definitely get rid of those reject critters. You can send that fork-and-knife kitty to me... you know, so you don't have to worry about it anymore. In return, I could send you some gum to stick on the coat when you're ready to cut it up. Worked for me with the lynx coat (which I blogged on for WIP today... along with the pattern for the chibis). Wonderful!! So cute!!! You're amazing. They are so cute. I like the Chibi cat with knife & fork the most.